San Diego Surge DB Sonfre Roberson (#2) during pregame warm-ups vs. Kansas City. 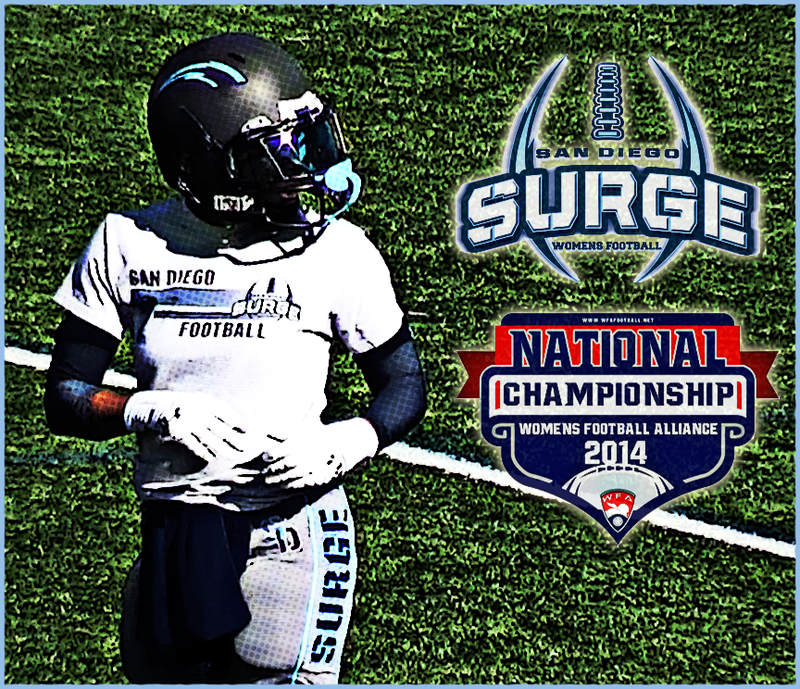 After rolling over every team they faced this season, the American Conference champion San Diego Surge (11-0) will finally meet their match when they square off against the National Conference champion Boston Militia (10-0) in the 2014 WFA National Championship. The game takes place at Lane Stadium in Chicago on Saturday, August 2nd with kickoff scheduled for 3:00 p.m. PST. You can watch it on PSBMN or Livestream. Along with their second national title, the Surge will be looking for redemption after falling to the Militia 34-19 in the 2011 championship game. After taking the 2013 season off, Surge quarterback Melissa Gallegos is looking to pick up where she left off in 2012, leading her team to a national title. "Going into this championship game, I'm feeling really excited and prepared," said Gallegos. "Our coaches did a great job of game planning and I, myself, have been religiously watching game film to study their defensive formations." Gallegos was able to put up 28 touchdown passes this season thanks to receivers like Kaycee Clark, Holly Peterson, Lanika Manning, and several others, but of course none of those touchdowns are possible without the Surge up front. Led by Christina Carrillo, Eboni Chambers, Jessica Cable, Katrina Walter, and Taiesha Williamson, the blocking in both the run and passing game has been outstanding throughout the season. "I can't say enough about my offensive line," said Gallegos. "They are truly the unsung heroes in our offensive success. Everything we do depends on their success, and I am proud and honored to have such a strong, fast, agile, intelligent, aggressive, and eager group of ladies to pave the way for our offense." In the run game, Alexis Snyder provides the thunder to complement the lighting of all-purpose back Deana Guidry. The two combined for six rushing touchdowns during the team's conference championship win over the Kansas City Titans. The Militia defense features a talented secondary led by defensive back Briannah Gallo. Other impact players include linebackers Jennifer Olivieri and Vicky Eddy, and defensive lineman Tomi Gibson. "Boston's defense is well coached," said Gallegos. "They're consistent, fast, aggressive, and they play well. If we can execute our game plan and keep the mistakes down, we got a shot at breaking them down." The stingy Surge defense will be met with the task of trying to stop an explosive option attack powered by duel-threat quarterback Allison Cahill and running back Whitney Zelee. Zelee, who earned MVP honors in the 2011 title game, rushed for 355 yards and six touchdowns during Boston's conference championship win over the Chicago Force. Her ability to utilize power, balance, vision, and breakaway speed to deliver home run plays has earned her the reputation as one of the premier rushers in women's football. "We just have to play contain," said Surge head coach William Harris. "We put our players in a position to maintain leverage, and ideally we don't want any one on one tackles. Someone with that kind of talent has to be tackled by more than one ball player." Helping anchor the Surge front seven is linebacker Knengi Martin. Martin, who also plays tight end, leads the defense in tackles, but she don't mind sharing with her teammates. "Everybody wants to be a part of that group tackle," said Martin. "So it's really a team mentality when it comes to our defense. It's everybody to the ball, everybody gets a piece." Another offensive playmaker to be accounted for is Militia receiver Adrienne Smith, who caught two deep passes for 93 yards against Chicago. She'll cross paths with Surge defensive backs Sonfre Roberson and Ashley Moody, who leads the team with five interceptions.